BROOKLYN, N.Y. (CNS) — Pride rushed through the hearts and veins of Albanian-Americans as they watched Albanian President Bujar Nishani unveil a statue of St. Teresa of Kolkata in the Bensonhurst section of Brooklyn Sept. 25. Hundreds gathered for the ceremony outside St. Athanasius Catholic Church where the figure of the founder of the Missionaries of Charity cradling a child in her arms has been installed. St. Teresa, often recalled as “a humble daughter of Albania,” was born to an ethnic Albanian family in Skopje in was then part of the Ottoman Empire and is now part of Macedonia. Joining Nishani were Albanian community leaders who organized the effort along with New York state Sen. Martin Golden and Msgr. David Cassato, St. Athanasius’ pastor. Invited guests included an imam, rabbi and Orthodox priest. Also in attendance was Bronx Assemblyman Mark Gjonaj, the son of Albanian immigrants. 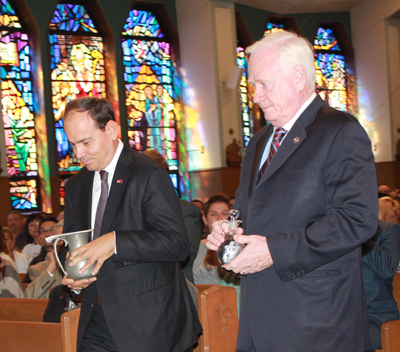 Albanian Roots, a nonprofit dedicated to strengthening the Albanian-American community in the U.S., and its president, Marko Kepi, raised funds for the statue from individuals and groups, including St. Finbar Church in Brooklyn’s Bath Beach neighborhood, and provided labor for the installation. Albanian-born Shpend Koleci broke out in applause with the rest of the crowd as the figure was revealed. Although he is Muslim, he loves his fellow Albanian. Young girls and boys attended the ceremony in customary Albanian garb, and young Julia Balaj was dressed in the signature white and blue-striped sari of St. Teresa’s religious order. Children sang and danced at a street festival after the formal program. Albanian-born Arjana Frasheri will see the new statue every weekday as she rides the bus to work. But she still wanted to be among the first to see it when it was unveiled. She and her husband, Genci, stood on the corner near the church for nearly an hour before the event. Having lived most of their lives under communist rule, the couple says they have no particular religion, but they believe in God and they believe Mother Teresa is a saint. At morning Mass, Msgr. Cassato spoke about the impact St. Teresa’s words and actions have had on countless people around the world, including the monsignor himself. He recounted meeting the future saint in the Bronx, and the challenge she gave him. “She looked at me in the eyes with her wrinkly face, handed me a medal of the Miraculous Medal, and said to me: ‘Be a good priest. Take care of God’s poor people,'” he said. And that means everyone, Msgr. Cassato said, admitting that sometimes even he gets conflicted about giving to panhandlers, unsure if the money will go toward buying dinner or drugs. It is then that he remembers what Mother Teresa told him. He pointed to the day’s Gospel from Luke about the rich man suffering in hell for failing to help his poor neighbor Lazarus in life, and the modern example of Facebook CEO and billionaire Mark Zuckerberg, who is committing $3 billion to eradicate diseases in the world today. “Today, let us all recommit ourselves to helping the poor. 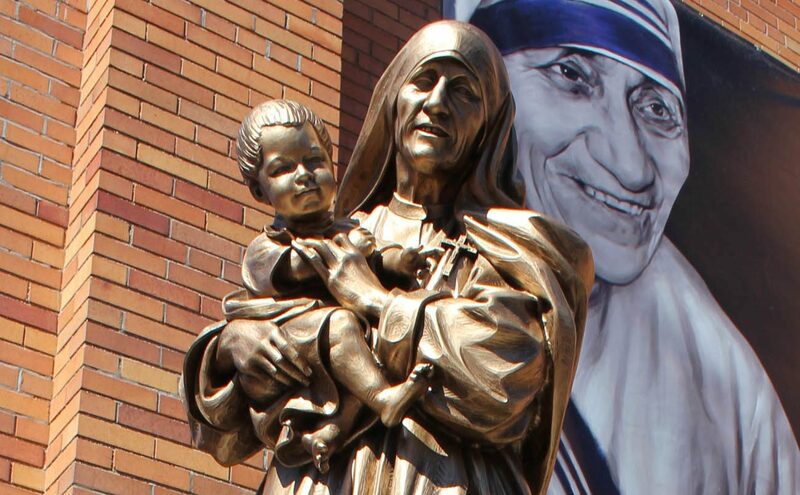 Let us be as Mother Teresa: people dedicated to the poor,” he said. Giossi is a reporter/photographer at The Tablet, newspaper of the Diocese of Brooklyn.